It wouldn’t be the poly filter. How often do you do a water change? Do you siphon your sand when you do a water change? Do you turkey baster your rocks frequently? Have you cleaned the chambers of the overflow recently? Excessive nutrients are causing the algae (and most likely impacting your corals), even if your not getting a reading when you test. So you’ve got to figure out what’s causing it and correct it. When you get back from vacation, start a regimen of manual algae removal and frequent water changes for a period of time. Also, make sure your fish feeder doesn’t over feed the fish while your gone or that will just exacerbate the problem. I'm on the other side of the country but I headed that way for a vacation and a wedding. It was one of the best vacations ever. So beautiful!! I already remove all the algae I see when I do weekly water changes, but I think doing a few smaller water changes, and getting algae then too, is probably a good idea. I'll hop on it when I return. Maybe it's my water? I'm using gallon jugs of distilled water from Kroger. It's tested at 0 nitrate and phosphate the few times I've tested but that was only once or twice. Maybe every jug isn't like that. Investing in RO/DI soon, maybe that can solve some of this. I wouldn’t think using distilled water would be the problem. Many people on here use it. A TDS meter could confirm it’s ok though. Having a RODI is super convenient and you’ll know it’s good water. 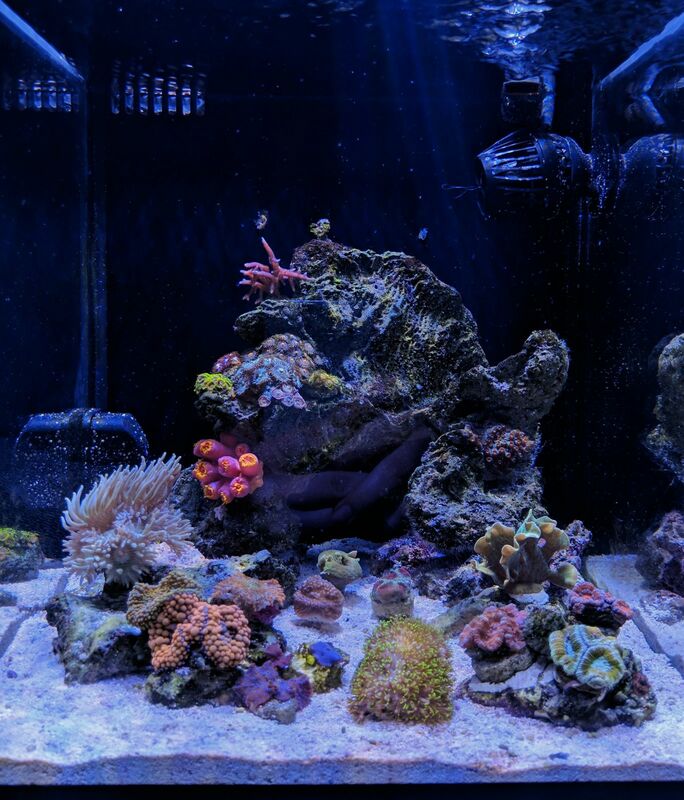 For a smaller tank, sometimes it can make more sense to find a local reefer making water or buy from a store that you can trust. I have done that in the past and it really makes this chore less "chore'sh". I was buying from an LFS but their water has a lower salinity than I really wanted, and sometimes was even lower than they stated annnnd is a long drive so I gave up on that. I never thought about buying from a local individual though, that's a great idea. I'll ask my local group if anyone would be willing to do that. Everything is growing and looking healthy again (I resumed spot feeding the corals and am doing some extra water changes here and there) but this algae just won't quit. There's bubble algae, turf algae, hair algae, these bubble-like stems, even some pretty little mermaid cup-like things occasionally. AAAHHHHHHHHHHRGGG! The last time this happened when I was starting my tank it was something I stupidly over looked. There was a skylight shining natural light into the tank for many hours a day. I put a shade up and it was fine. Is there something else obvious that I'm missing now? 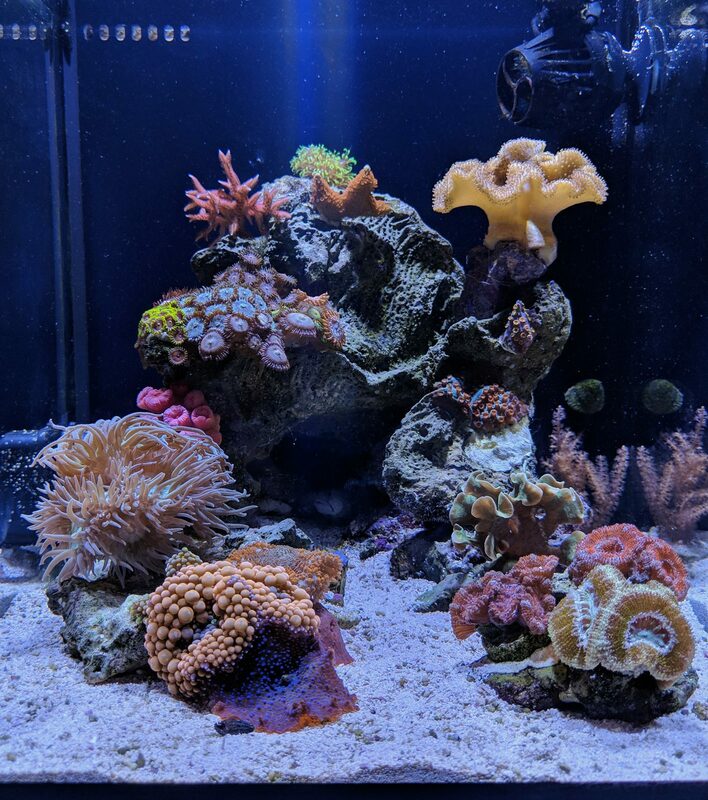 I stopped spot feeding corals when I started noticing more algae, then some of the corals were starting to not look as good and the algae wasn't slowing down so I started feeding again, and now the algae is going stronger. I try to do coral feedings right before a water change. I don't feed the fish that much, just a few flakes a day and it eats most of it. I got the skimmer working. Lighting is fairly normal, a lower David Saxby preset. My water is distilled from Kroger and I'm mixing it with Reef Crystals. Nitrates were seeming a little high at 5-7 for a few weeks but today were only .2 (maybe because of the extra water changes or skimmer running.) and phosphates are still at 0. Tons of algae regardless. I hand pick with tweezers weekly and it all returns (though I'm scared to touch the bubble algae at this point as it seems I always manage to burst at least one capsule). How do I figure out the root of the problem? Should I go ahead and get an emerald crab and try another hermit before it gets out of control or will that just mask the problem? It really did feel like the algae started when my hermit died, but I don't think a single hermit would have actually been eating that much! Honestly, I feel less like there is a "problem" now that all the corals are looking better, but obviously don't want my tank overrun with algae. Any advice? I feed my tank heavy at least twice a week and don’t see the issues you are having with algae. When I say heavy I mean a 1/4 teaspoon of Reef roids mixed into a paste and half a frozen cube of mysis shrimp. Also a few pellets to keep the fish and shrimp away from the corals. Lighting is on an 8 hour period as well. I use Walmart distilled over any other brand and mix with Reef crystals as well. I am having the exact same issue with algae.. Curious to see what others recommend. Love your coral picks - definitely taking notes! Hope everything clears up for you! I am aware my opinion may not be the popular one, but having some algae on the rock in your tank....is it that bad? I have some bubble, short areas of GHA and some calerpa snaking its way around things. 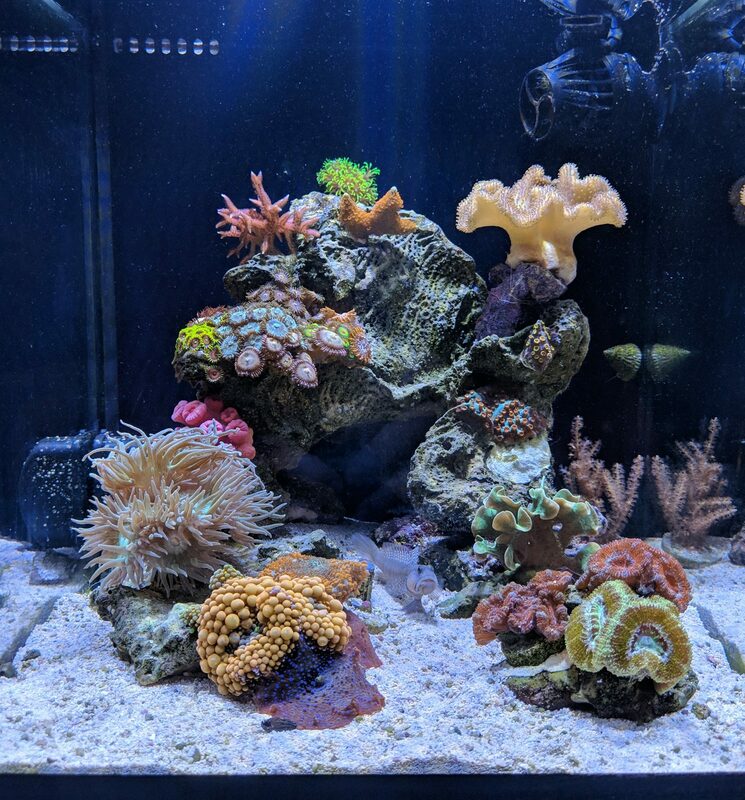 It barely grows, the corals are happy and the fish are happy. Why try to fix it if its working? I realize the standard of reef tank care has been set so that ZERO algae in the display is the expectation, but is it realistic for everyone? Was the tank started with dry rock, or was it dry before coming to the LFS? Sometimes dry rock can leach phosphates. My 5.5 last year when I added some dry rock developed some bad turf algae that tried to take over the world, er...tank. I wonder if adding a little something to reduce phosphates might help? Also, did you rinse your sand? I didn't rinse my Fiji pink sand at first and feel it might have contributed to some of my issues with algae in my 15L. 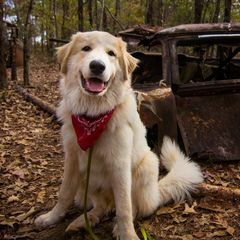 You can try spot treating with peroxide, there are tons of posts on it. For ailing corals you could try a Lugol's iodine dip. Couple drops of Lugol's per cup of tank water, stir and dip coral for 3-5 minutes. It's not a cure-all but it can help. Generally speaking, no, a little bit of algae isn't necessarily bad, but the pest algaes are more efficient at uptaking nutrients than other things so they can grow to be a problem easily. High nutrient tanks will often have a little algae but it needs to be continually pruned so it's not out of control. Algae has been known to grow over/crowd out corals which is obviously not what you want. 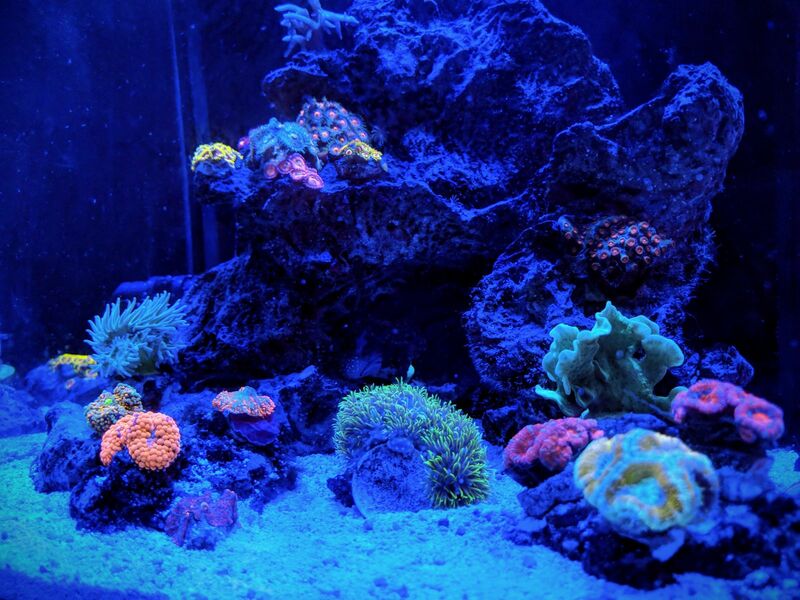 It can also be a sign that parameters are not optimal for corals and need to be adjusted. I usually have a little algae of some kind or another but I try to keep it under control because I like my coral colors better than I like the algae. I realize the standard of reef tank care has been set so that ZERO algae in the﻿ display is the expectation, but is it realistic for everyone? I definitely appreciate this opinion! I've been thinking about it now that my corals seem to actually be doing really well. I think the current amount is still a little more than I'm happy with, but as a newbie it's good to know that it doesn't necessarily, automatically mean something is wrong and that some people are totally fine with it! Was the tank started with dry rock, or was it dry before coming to the LFS? Sometimes dry rock can leach phosphates. 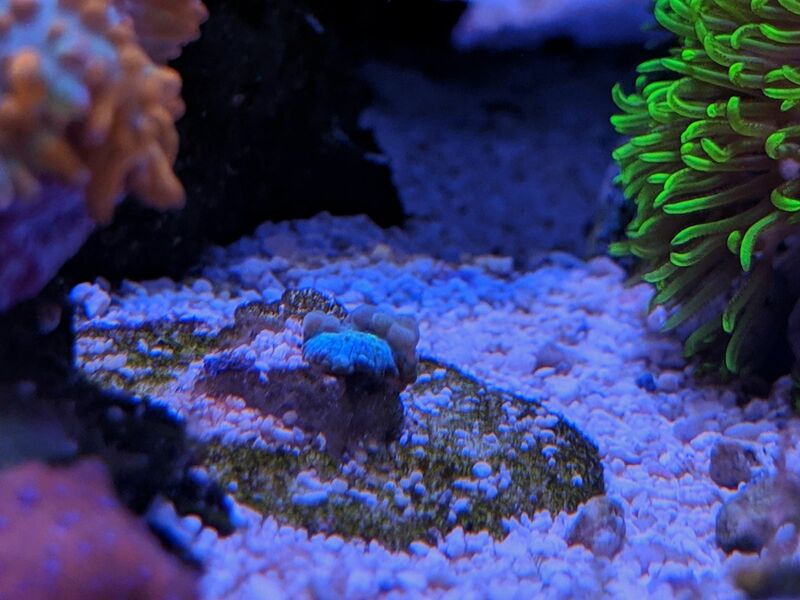 My 5.5 last year when I added some dry rock developed some bad turf algae that tried to take over the world, er...tan﻿k. I wonde﻿r if adding a little something to reduce phosphates might help? Also, did you rinse your sand? I didn't rinse my Fiji pink sand at first and feel it might have contributed to some of my issues with algae in my 15L. It was live rock from a LFS. Now that I have some idea of how this all works, I'm guessing their live rock was more like half-dead rock and who knows if it was dry or live or cured before then, so it's certainly possible I've got a leaching issue. I'm going to give it another couple weeks doing manual removal and more water changes, maybe go ahead with an emerald crab and/or hermit to help me out, and just see what happens before trying GFO or peroxide. I'm also interested in trying out some display-worthy macro algae, which might help a little. 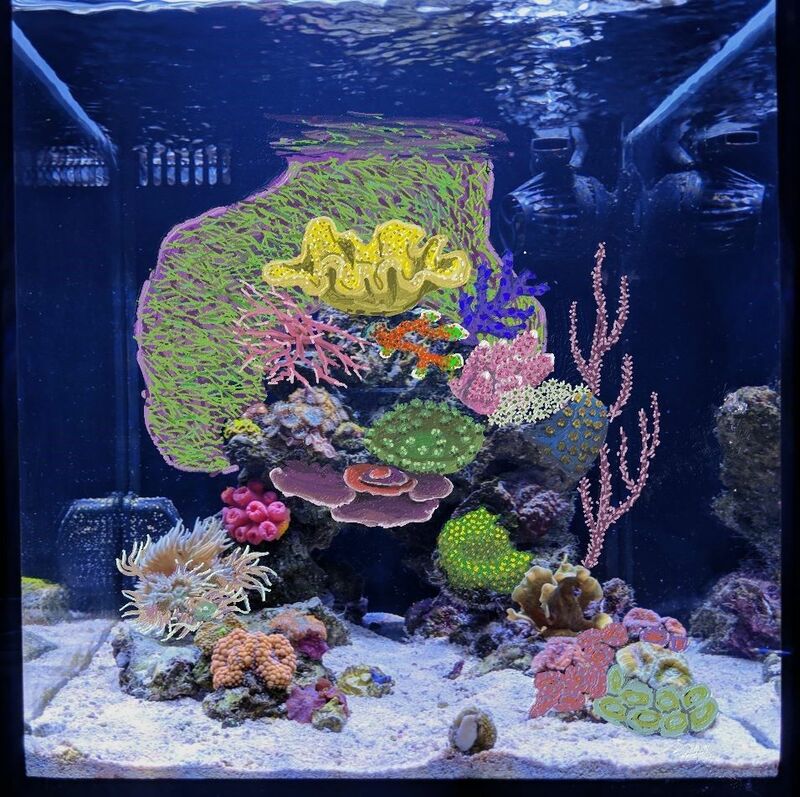 I don't see many tanks with macros as well as a lot of stony corals so maybe this isn't really feasible, but I'll do some more research on it! I think maybe the algae has slowed just a little, but still coming back every week. 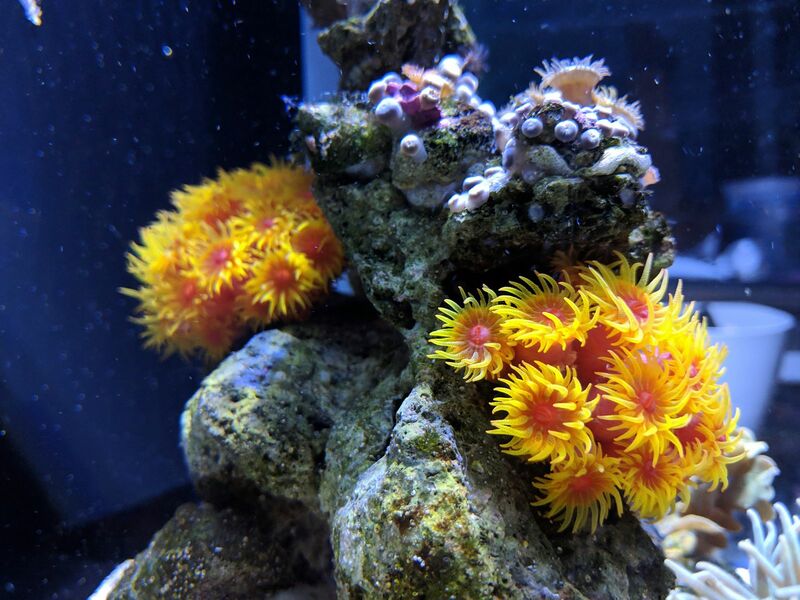 The corals seem better than ever though, extra fluffy and colorful the past couple weeks, which I take to mean very healthy and happy. I installed a Spectrapure RODI system and am feeling like maybe that's made some slight improvements. I also finally figured out my over-heating problem. The cobalt neotherm heater seems to be incorrectly calibrated and I have to just turn it way down to get to 78/80. Not happy about it, but seems to be stable in its incorrectness. Bought an inkbird temp controller to make sure nothing goes haywire but still need to install it! 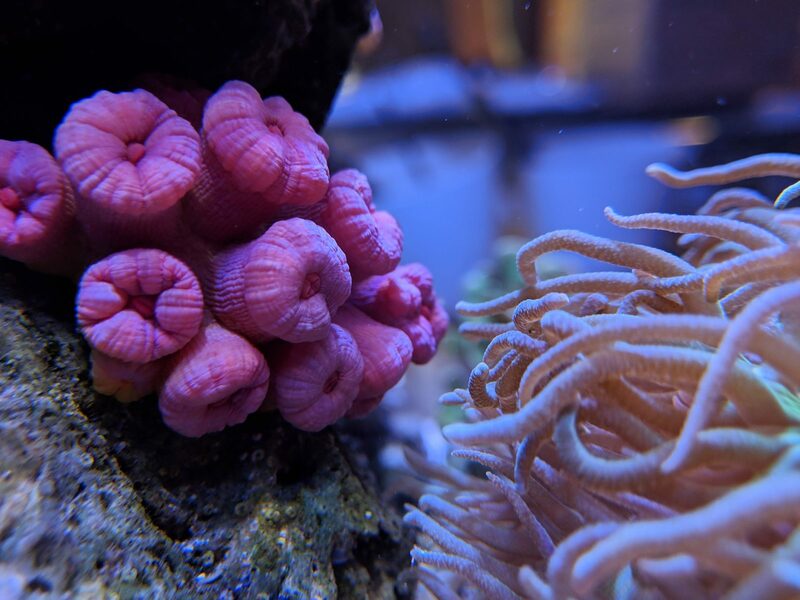 There was a pretty pink sun coral in the liveaquaria diver's den a couple weeks ago so I ordered that as well as a blue mushroom (basic, I know, but I think they're so pretty!) and a hermit crab and an emerald crab to help with the algae. 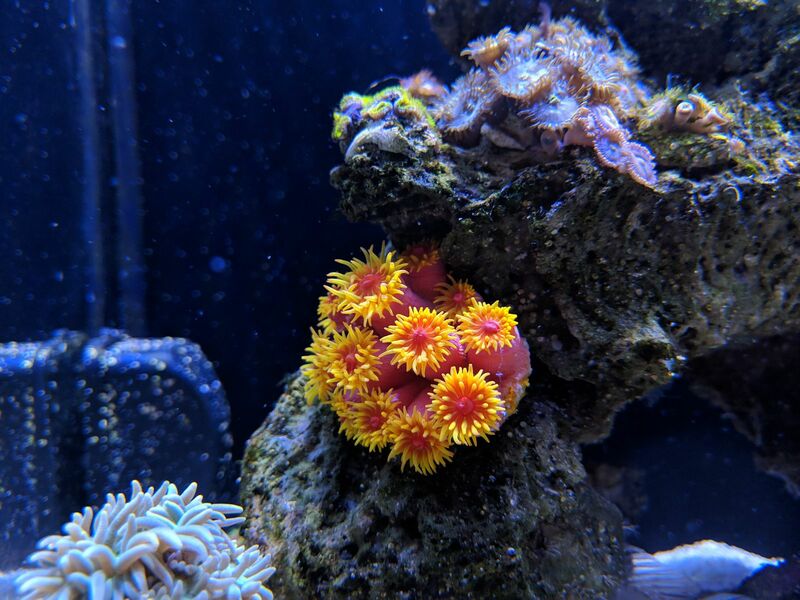 THE SUN CORAL IS INCREDIBLE!!!!! The colors are so bright and I'm so in love. It was a huge piece (for this tiny tank at least) and I couldn't even fit it in any shaded areas of the tank so I very trepidatiously whacked it in half. Great success! One piece fit perfectly in its assigned spot and the other is behind my rock waiting to be sold. They all started eating as soon as I tried to feed them and now seem to open up any time I put my hand in the tank for very long. So cute and hungry! I finally cut off some pieces of the GSP and glued to the back. That chunk in the middle as well as the mint pavona, favia, and monti cap (that is ever so slowly getting its color back!) frags in the center are all going to be sold/traded at some point. I moved my main rock arch back almost against the wall because the duncan is out of control and going to be HUGE so I wanted to give it some more room, give the sun corals space to shine, and mayybbeee create space for more coral. I already feel like I'm going to run out so soon! 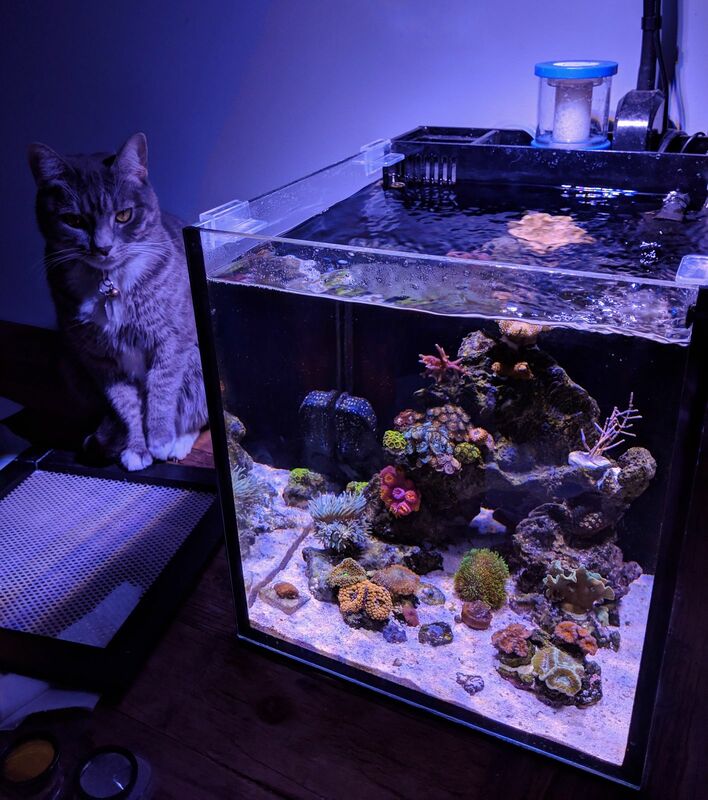 I am loving how your tank is shaping up. And I agree, sun corals are cool and your pink one is amazing! 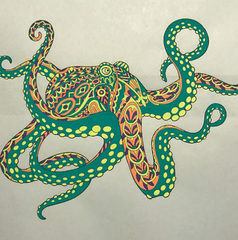 Thought I'd share my new coral plan drawing. I've changed it up and added a lot after finally starting to really like some of the branching SPS and finding a couple other things I really wanted. I've gone back and forth on it but am feeling like I NEEEED to have a yellow fiji leather so I'm going to try to make it work as my top centerpiece and hope it doesn't grow too quickly and shadow everything else out. I threw out the idea of monti caps pretty early for many of the same reasons, but am starting to like the idea of having some mid-way on the rock. There's nothing directly under that area so I figured something that would grow out horizontally could be a nice use of space and continue the shelf-like aspect of that level. Should be easy to frag there too. I'm thinking about a bubblegum digi, really nice blue acro like an oregon or cali tort, and a pink mille or other really bushy and hairy acro for the other additions at the top. 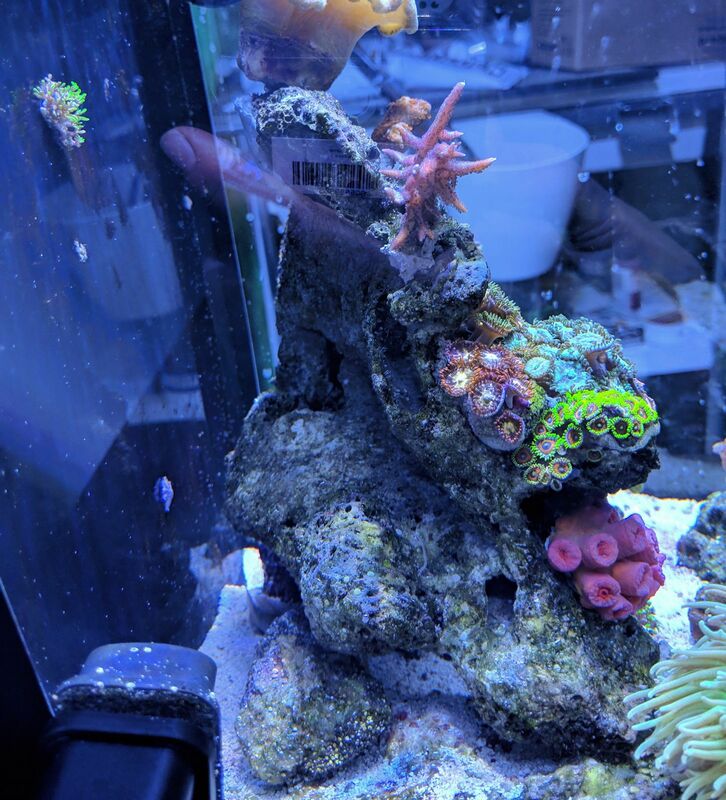 Really loving the look of leptastrea and thought a John Deere would look good over on the lower right of the main rock. Then want a bizarro cyphastrea over there with the meteor shower. Wanting to try a gorgonian, but an easy photosynthetic one like the Grube's. Then still really would like a pagoda cup and green and white pipe organ. Let me know if you see any problems with all this! The main issues I'm thinking about are that it's just pretty tricky to keep everything really healthy with this kind of variety from SPS to NPS, then also that this 2D drawing just isn't truly acurate and to scale so things aren't actually going to fit where I want them to and crowd/sting/shadow each other. Overall the tank has been ok, but struggling to keep things balanced and nitrates low. 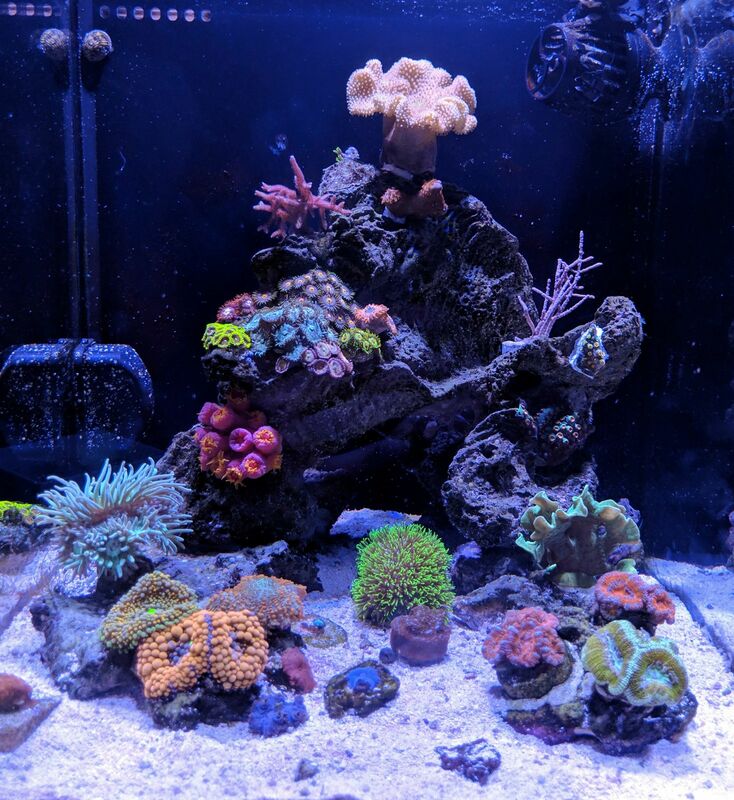 Regardless, I couldn't resist getting new corals at my first local frag swap so I'll update about all that stuff sometime soon. Looks awesome! Very well planned out. I had to give a double take as I have never seen someone do this! Got a lot of new stuff! 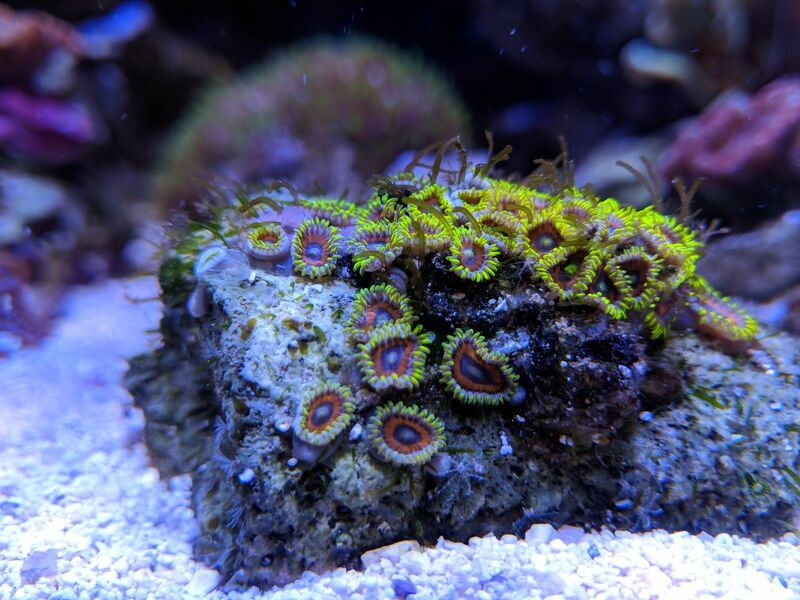 A little nervous because I feel like things are slightly out of balance so obviously not a great time to add coral, but we had a local frag swap so I couldn't pass up on a few deals. Then I also saw a nice sized yellow fiji leather in the Diver's Den, so I jumped on it but got a Grube's Gorgonian too to get free shipping. They really get you with that! I feel like I just HAVE to get something extra whenever I order from LiveAquaria, because the free shipping limit is really pretty low and I'd much rather pay $30 on another coral instead of shipping, but of course it's never just a $30 piece! So in all, in addition to the leather and gorgonian, I got a bubblegum (or forest fire... seems like these are the same, right?) 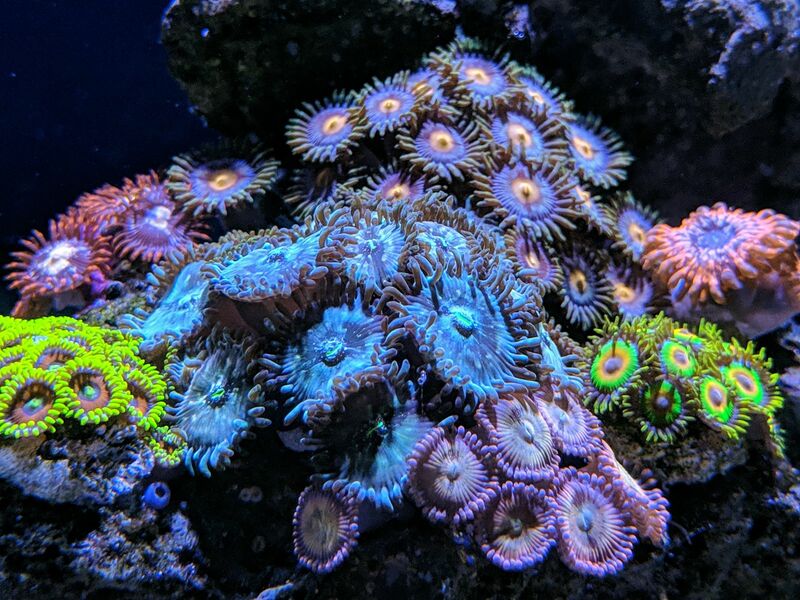 digitata, bizarro cyphastrea, chromatic cyphastrea (looks amazing on the coral shoppe website, looks like poo in my tank so far), neptune bounce mushroom (always liked these but definitely wasn't planning on getting one any time soon, just couldn't pass it up at the swap 🙄), and an utter chaos zoa frag (again, wasn't planning on getting anymore zoas buuut there was room to squeeze one more in). After letting these all acclimate for a couple weeks I just glued most of it down today. Skimmer has been putting out microbubbles for like 6 hours now but hopefully will be calmed down in the morning. Everything seems pretty healthy except for the gorgonian. 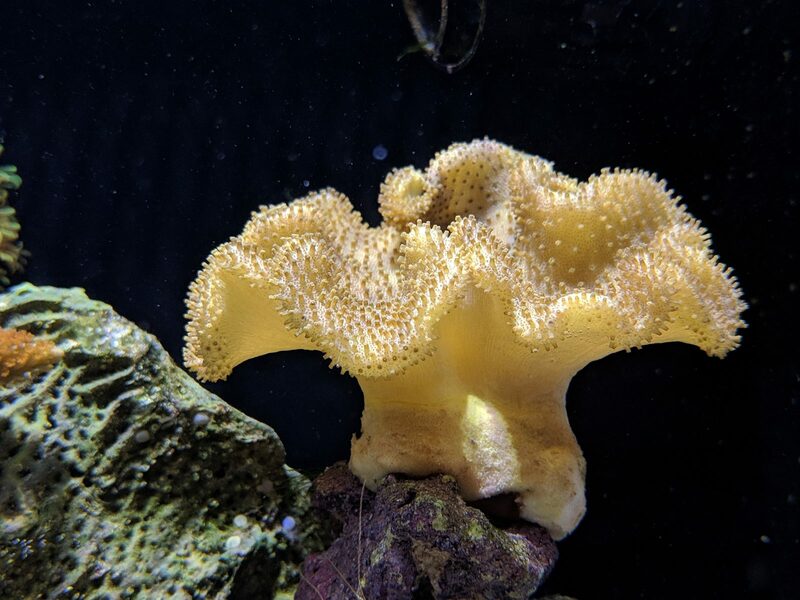 It hasn't extended its polyps at all since I got it in the tank. 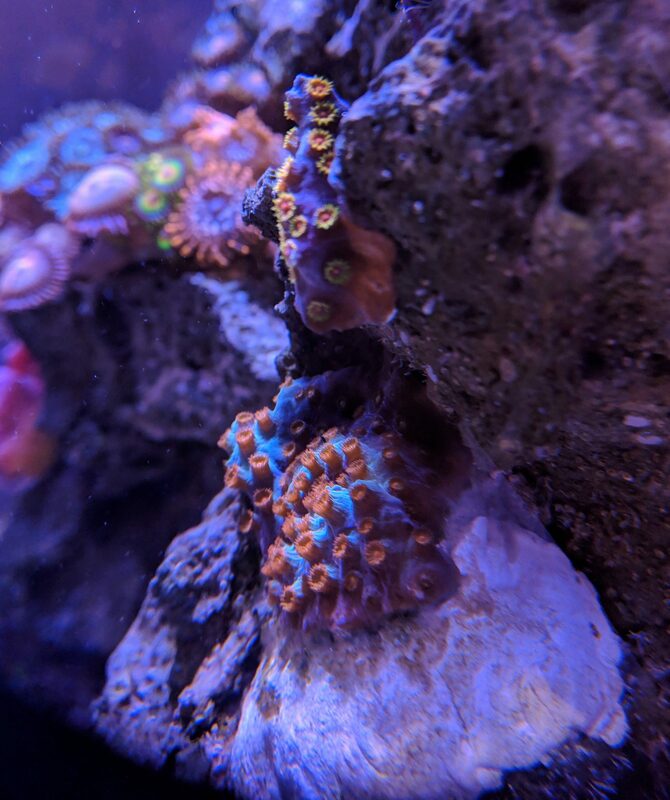 Until today, when I saw maybe 10 polyps starting to peep out here and there RIGHT before I started working on gluing everything so of course they went back to hiding. It also has lost flesh on a tiny little area. Going to give it a couple more days then might try to get my money back before the 14 days is up. The digitata lost a tiny bit of color but only today has been in higher light so hopefully that will improve. The leather also isn't as brightly colored as I'd like, but it was only put at the top today as well. this pom pom's patterns are so fancy! Surveyman, what nutrient export methods do you use? How much rock do you have? I was re-reading the info people shared and am re-affirmed that I'm definitely not over-feeding. I forgot to mention earlier I also was thinking I might just not have enough rock for adequate denitrification. There's probably only 5 or 6 pounds in there. I was thinking about it and I could probably fit in a little more rock on the back ledge of my main arch piece without disrupting too much of the general layout. My yellow fiji leather is also not staying up there at the tippy top very well, and I wish it could sit slightly lower, so maybe I could attach it to a new rock that sits just behind the main piece. What's the best rock to add to an already established tank? Just good quality dry rock that can slowly populate? I'm definitely wary of going to my LFS and getting the same live rock I started with. I put Seachem Matrix (this is similar to what you're talking about, right?) in one of the media basket sections but I wasn't sure that it would be enough to make much of a difference. I was curious about putting a bigger bag of it in the lower back chamber with the return pump but was worried about waste collecting back there. Maybe there's some other IM owners that have experience with this. In my Nuvo I have around 7-8 lbs of rock. I only use filter floss and chemi-pure blue in my filtration. Long time no update! I got busy and distracted over the holidays and the tank probably had the biggest dip in care since its creation. I went one and half, probably two, weeks without a water change twice in a row and didn't feed routinely. Nothing seems to be toooo worse for wear and the nitrates and phosphates seem to have actually steadied a little. I'll just dive into what's been going on since the last update. - Yellow leather fell off its tippy top spot after a few days. When it fell off I realized its stalk was actually wrapped around a big shell so I took that out and used the sewing method to tie it onto a new pedestal. It's been weeks and it doesn't seem totally attached yet but definitely looks like it's working on it. I'll probably still move it and its rock back to the top eventually. - The cyphastrea started looking really bad in the shadowed area, actually before I started slacking on water changes. In fact, though it really didn't seem to be at the time, the skin definitely started peeling away like markalot was saying! - The emerald crap is killin it in the algae eating arena, so now algae has just started growing in the back chambers. Is this bad? Is it great? I'll have to look into it, but it does tell me those phosphates are still probably higher than my readings. - The hermit crab lives!!! After months of not seeing anything (except for a body I examined thoroughly and determined there was no way it was just a molt), one of the hermits from yesteryear climbed out of its hole and is happy as a... crab. Who knows, maybe there's actually still like 3 hermit crabs living a nice family life together somewhere in the darkness in there. I really doubted the people that always say things disappear in their little 7 gallon tanks to reemerge months later (like they obviously must not be very observant... do they even CARE about their tanks?!) but now I realize it definitely happens. - The purple gorgonian finally extended its polyps and seems super happy! I'd given up on it! It stayed completely closed and even lost some tissue for like three weeks! 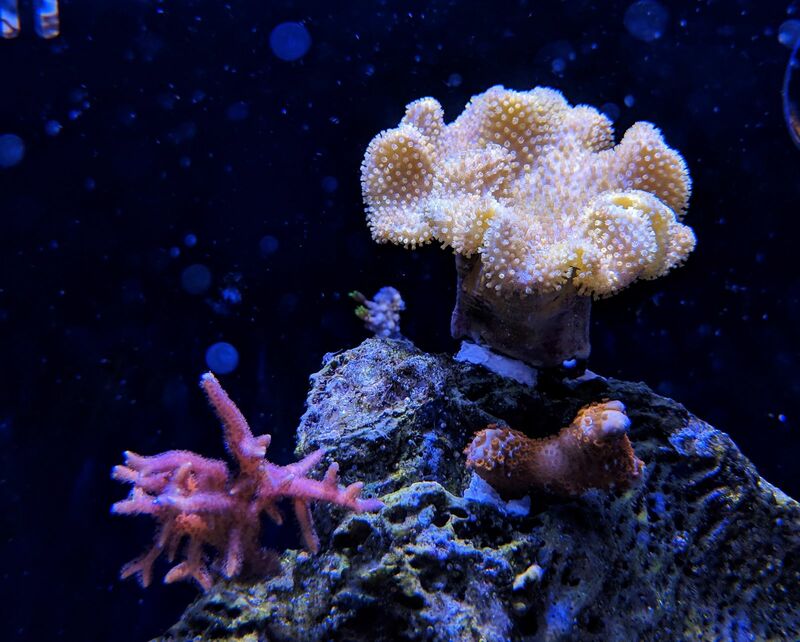 - The sun corals are mad at me, or maybe the duncan, or probably both. After the lapse in feeding, they are being reeeaally difficult to feed (after being so easy and well behaved since the day they arrived) and don't even seem to extend their polyps much even late at night. The ducan has grown so much and seems like it should be brushing up against the suns though I never really see them touch. The tips of the duncan tentacles seem white and kinda squeezed up... wondering if it is constantly straining to avoid touching the suns or trying to charge up for attack but doesn't really have much of a punch. I'm sure the suns are also pissed/weakened from not being fed much in the past few weeks though. They look puffy and healthy, just don't want to stick out their yellow tentacles. Hopefully now that I'm feeding regularly again they'll get back to normal cause I don't really know what to do with this duncan besides cut it back down to a head or two and it's too glorious for that! Everything feels like it's growing incredibly quickly. It's so fun to look at old photos and see how far everything has come and I'm quite pleased with everything. My boyfriend (who this tank was technicalllyyyy for 😂) keeps joking about when I'm going to make us upgrade to a 20 gallon but I'm really trying to hold off on that... for a few more months. 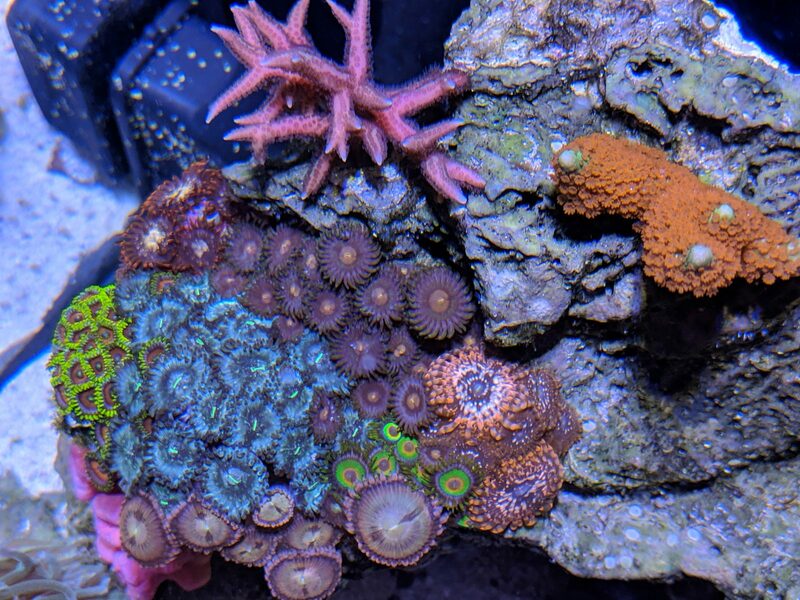 The definite future plans are to get a john deere leptastrea from a local reefer, maybe try having a red and purple monti cap ledge in the center, getting a pagoda cup to go to the right of the utter chaos zoas before they take over the whole rock, get an oregon or cali tort, a really fuzzy pink/red acro, probably a milli, and constantly keeping my eyes peeled for a green and white pipe organ coral. Still thinking about the yasha goby and a possum wrasse, but I'd feel so guilty for ditching Graygrumps and am entertained enough by the corals. Best part of the holidays was our New Years Eve party when at like 1am I convinced everyone to come upstairs and check out my tank and they were all SO INTO IT (always astounds me how often people feel meh about it... I make everyone come look when they visit but so often people check it out, say oh that's cool, then walk away) so I was feeding everything and throwing out all the scientific names, the crowd was captivated, and then I busted my own wine glass right next to the tank. Woohoo! I love the way your tank looks. I knew that gorgonian would open, they are especially sturdy and nice. The figi leather is perfect. 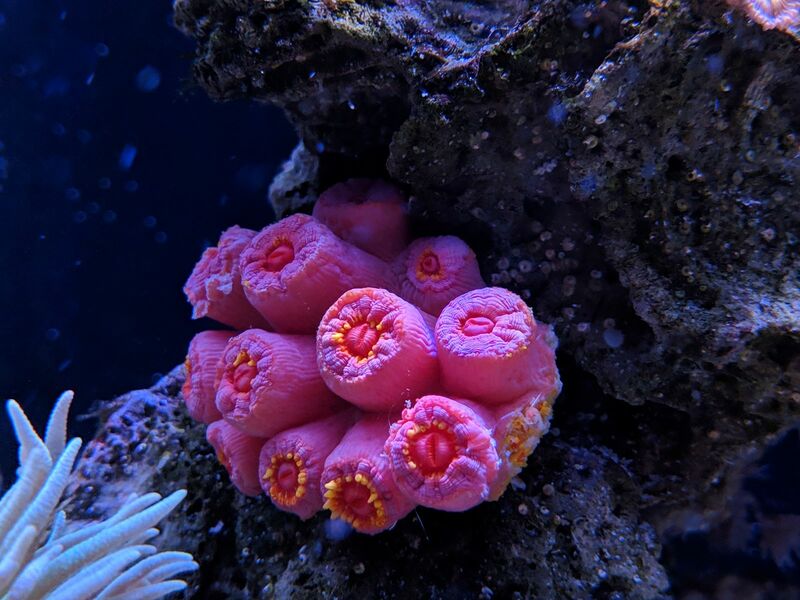 That is a coral I want someday too. 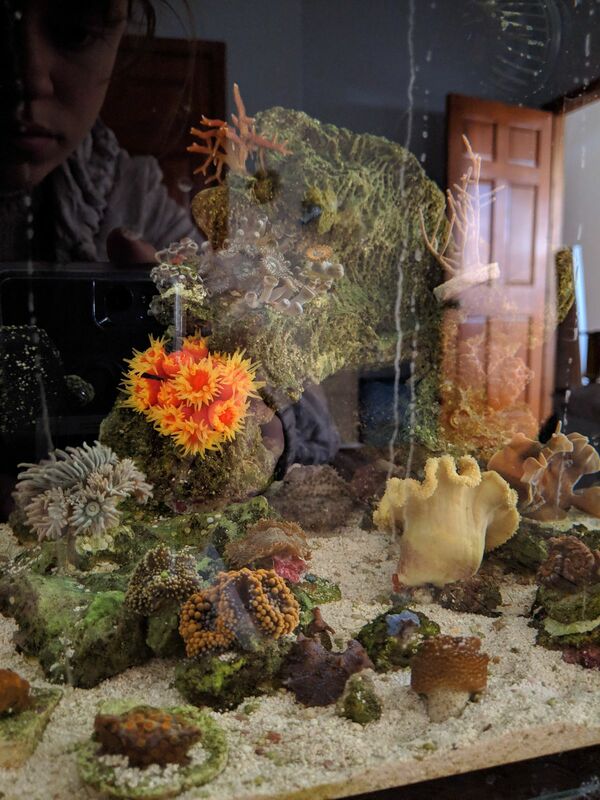 I loved your tank photo where you drew in your future plans and its fun to see it get executed now. Tank is looking great! Glad your Grube's is doing well, the one I got did not do well and eventually died, sadly. 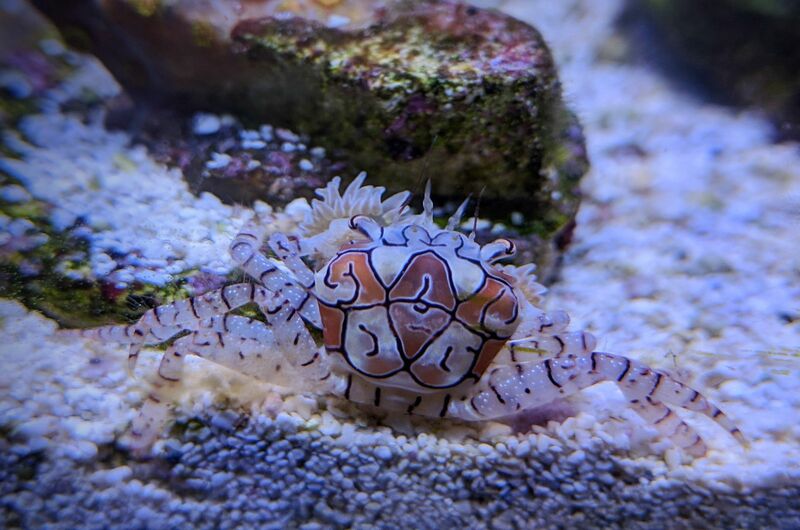 I do have a similar one (same species but supposedly purple, from Live Aquaria...I dunno, it kinda looks the same pink to me lol) in my pico and love it. 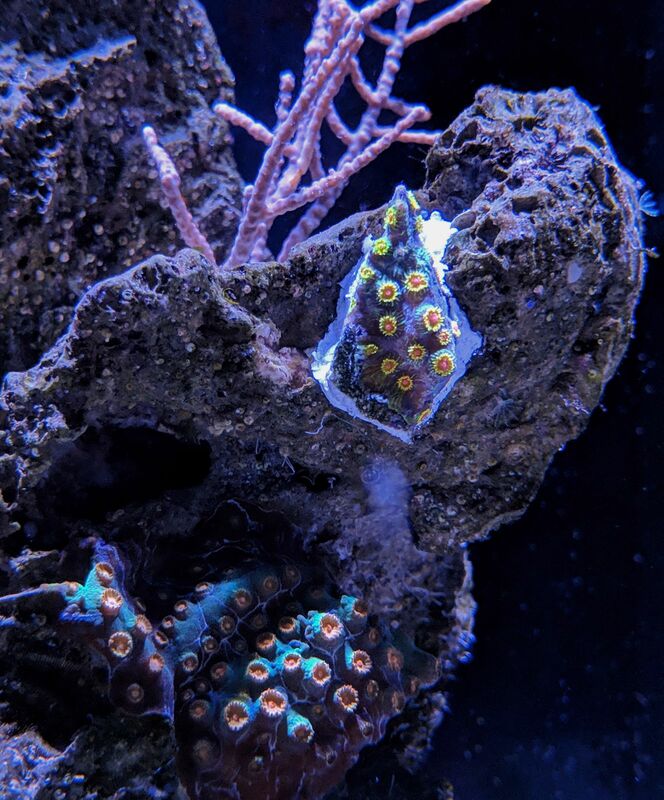 If you decide to add more rock, I'd suggest either BRS reef saver rock or dry rock from Reef Cleaners (these are both clean and don't have a bunch of dead organics to decompose), or get some live rock and let it cure in a bucket before adding it to the tank. If you go with the dry rock, it's a good idea to soak it for a bit with water changes to help give phosphates a chance to leach out so it doesn't create algae issues.